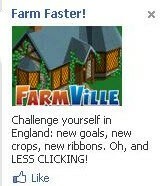 FarmVille Land Expansion Coming Soon? 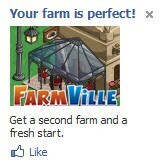 I just saw a weird ad on the right side of FaceBook for FarmVille, and I'm so glad I clicked it!!! This is apparently some new expansion that has not been mentioned ANYWHERE. Wanted to make sure you guys got the scoops. So there is some kind of a "second farm," a "fresh start," "more land," and something to do with Kansas! ?